LARGE BLACK STAGECOACH LANTERN home decor, jewelry, decor, decorations, electronics, fountains, floor mats, art glass, vases, garden essentials, fireplace screens. 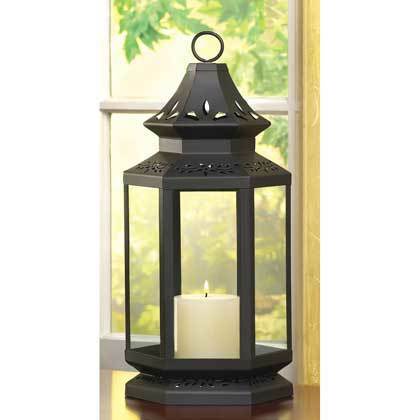 Stately stagecoach lantern is designed to impress! Elegant framework of matte black metal makes a dramatic statement when backlit by an oversized candles golden glow. Candle not included. Material(s): IRON GLASS. Weight 3.2 pounds.Dimensions 7.5" x 6.5" x 16".